Piercebridge Roman Fort features interpreted remains of a fort site known as Morbium, which dates back to around AD270. Some of the finds from this historic site are on display at the nearby Bowes Museum. The fort itself was built around 260-270AD and was maintained from c.290-350AD, with some later development. The fort appears to have followed the standard Roman plan, being rectangular in shape with towers at each corner. In the centre of each elevation of perimeter wall would have been a substantial gate through two of which Dere Street would have probably passed. Internally Piercebridge Fort would have comprised of several barracks blocks, granaries, workshops, the headquarters building, and the commandant’s house. Parts of the ruins have been excavated and are open to the public. Admission is free and the site is open to the public at all times. 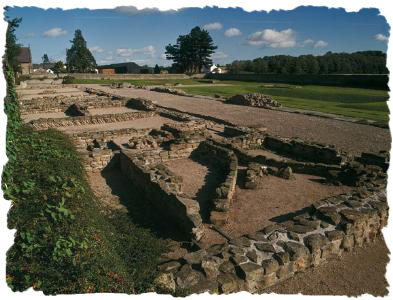 Visible Roman remains at the site include the east gate and defences, a courtyard building and part of an internal road, though a large proportion of the substantial 11 acre fort now lies under later buildings, but a section of the eastern elevation is now preserved and on permanent public display.